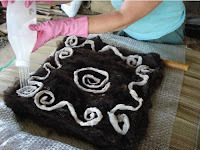 A Beginner's Guide to Felting by Gabrielle. It’s been quite a crafty time for me of late. 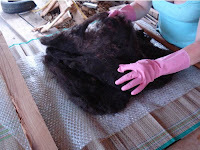 After the sheep shearing we had a pile of wool to deal with and it my job to find things to do with it. I have never learnt to knit; my mother did try several times to teach me but it was evidently not one of my talents. I read all about felt and liked what I read. Felt is easy to produce, probably one of the oldest crafts, and produces a material that is warm, waterproof, flame proof and extremely hardwearing. I set to with the holy trinity of distance learning: books, friends and Google to discover what I needed to know. I first washed the wool in a mixture of soda crystals, soap flakes and warm water, taking care not to agitate it too much (which would start the felting process a stage too soon) and using, to excellent effect, a plasterer’s trough and a wire shopping basket from Tesco’s (liberated from its mundane supermarket existence to a new life in the country) in order to lift and lower the wool in and out of the very hot soapy water. Once the wool was washed, rinsed and completely dried (this in itself takes several days) I carded it using my lovely new drum carder that was a Christmas present from Stuart. 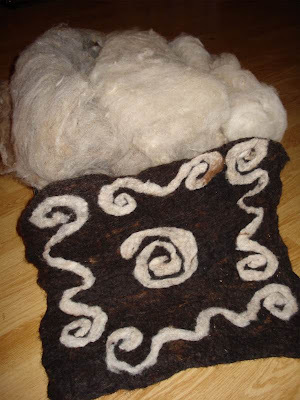 The wool was now like candyfloss, lying in large rolls, called rolags (see photo at top with the finished article. The correct term is apparently a "batt", thanks Emma, for your comment, below) on the kitchen table and was ready for felting. I set myself up with an old bamboo blind, a large piece of bubble wrap, soap flakes and a kettle for an ongoing supply of hot water. 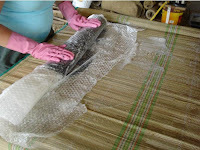 The basic principles of felting are to lay wool out in fine layers then soak it with hot water and soap then agitate it: rolling it up in a bamboo blind lined with bubble wrap works perfectly. I have mostly black wool from our Ouessant sheep but also some lovely creamy wool from a Val’s flock, so I was able to add a contrasting motive to my first piece of felt. I was really pleased with the result and may turn it into slippers or simply keep it as one piece for a cushion. Full of confidence after this early success, I’ve since started to experiment with natural dyes: more on that soon. For further guidance, a useful web article, The Ancient Art of Felt-making by Amanda Hone and a book, Complete Feltmaking by Gillian Harris. What a relief to see, at last, someone has genuine writing skills in La Haute Houssais! It's difficult to grasp the proportions of your finished piece but to think of turning it into slippers seems an abomination. Why not just frame it? And, by the way, Tesco shopping baskets are very sociable animals and like to live in large groups in their natural habitat. There existence is far from mundane. Call yourself a permaculturalist? Wetfelting is fun, isn't it! I use it to make sheets of multicoloured felt that I make into jewellery. I'd like to try felting around a form as well at some point. You can buy small packs of coloured merino at Truffaut and there's a small craft shop near H&M in Rennes that does it too. Alternatively, you can dye white wool using either natural dyeing techniques or acid dyes. Food colouring can be used as an acid dye, along with white vinegar as a fixing agent. Technically, what comes off a drumcarder is a batt rather then a rolag. Rolags are made on handcarders. Have you thought about learning to spin? You can start with something as simple as a length of dowel, an old cd and a hook to make a basic drop spindle. You don't have to knit with the yarn (although I love to knit), you could also weave or crochet. Finally, have you heard about the Biozone fair in Mur de Bretagne that's coming up? It's on the 13th and 14th Sept. We're hoping to go as we went to self-build soon and want to include as many eco-friendly options as we can in our very small budget. Well done! If you or anyone in Brittany or GB would like to hire a wet felter that would like to make very large pieces of felt, up to an inch thick and 4 foot x 3 foot in 20 mins using up to 2kg of carded wool at a time (and thats a lot!) get in touch! We have the technology, the equipment, the wool(or bring your own)AND will train you! Housed in an eco business unit in Devon complete with state of the art indoor compost toilet and biomass boiler it is the biz! You can also hire the unit once trained to set up your own micro enterprise! Thanks to everyone for you comments. Emma I would love to get in touch as we could perhaps share some ideas on felt, wool and self building! perhaps you could email me with a contact email or phone number? And Dot slippers can be wonderful artistic creations you know. A thing doesn't have to be in a frame to be considered art, not by me anyway and I'm a 'dyed in the wool' arts and crafter!